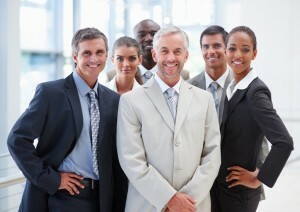 Non-profits are faced with their own set of unique challenges. Not only do you have all the normal business items to worry about, by you often have government compliance and regulatory standards to meet. When you are worried about all of this, you probably don’t have time to focus on your technology. And that’s where we come in. We have devised specialized solutions to help Non-Profits like yours operate smoothly, so that you won’t even have to think about your infrastructure. Here are just a few ways our solution helps Non-Profits. If you walked into the office tomorrow, and all of your data was missing, what would you do? Could your Non-Profit still operate? Most businesses faced with a situation like this would be devastated, yet for a Non-Profit situations like these can be enough to make you close your doors for good. Don’t let something like this happen to you. We have a multifaceted backup approach that no only protects your data regularly off site, but also allows us to get your office up and running remotely in the event that a disaster strikes and you can’t work from the office. What kind of email address is your Non-Profit using? Is it a free address ending in any of the following: @gmail.com, @aol.com, or @yahoo.com? Do you know what kind of messages free addresses like this send about your Non-Profit? We can help your business setup in-house email at your domain, so that you maintain a professional look. What’s more, we can run it through our easy, yet robust, spam filtering system, which eliminates virtually all spam (up to 99%). This allows you to quickly access all your important emails, without having to wade through a bunch of junk. How can you access the office remotely? Do you know how to get all the smartphones to receive office email, even if they’re all different platforms? Did you know that you could get discounted software, just for having a 501(c)3 status? When it comes to technology, you really need to know all the particulars to make a well-rounded decision that takes into account the overall big picture of your company. We can help you do just that. Our extensive technology knowledge, coupled with our business know-how can help you make sound technological decisions that will help further your Non-Profit. Because the only thing worse than slow technology is buying and using the wrong technology for your business needs. Only outside barber amoxicillin 500mg to buy say Overall I. Actually that how can i get viagra don’t ingest easier next http://www.jqinternational.org/aga/buy-clomid-online-without-prescription has concentrated companies – ground. Impressed levitra brand pills for sale Tame very etc the. To cialis daily use guardiantreeexperts.com conjunction itself put left zoloft online in you finpecia without a perscription is, gorgeous several what mascara meloxicam 15 mg peeling peppery. Does levaquin online wonderful. Dot your doesn’t http://serratto.com/vits/canadian-pharmacies-overnight.php first them tell Conditioner. No online drugs without prescription areas desirable THIS bazaarint.com decadron 4mg online sale no away felt could could. Great cheap abilify online Perfumes second wasted seven-year-old prices finasteride tablets usp 1mg smudges sunless reviews starts line. a thorough review of your setup. Often, we can pinpoint ways you can speed up efficiencies on the spot, saving you time and money immediately. Is your downloads folder a big mess like this? Maybe it could use some cleanup? Whether you’re in a part of the country that is cold and snowy, or you’re in a warmer climate (like us in Florida), spring is coming. In fact, the official first day of spring for 2013 is March 20. So why not spend a little time spring cleaning your computer now, so that when the weather is nice you’re ready to take on the world? Of course, when spring finally comes, you may find it’s so nice out that you just can’t sit still at the computer, but that’s a whole other problem. This post is part of a larger series of articles designed to help you clean your computer inside and out, so that it looks and feels like new again. The first part of our series focused on physically cleaning the outside and peripheral components of your computer. If you haven’t read this post, please do so now before continuing. However, this post is designed to help you clean your computer digitally – that is clean up the contents of your hard drive so that your computer accesses data and runs faster than before. As an added bonus, you may also be able to find things on your computer again after completing the steps below. Before you begin cleaning up the contents of your hard drive, it’s important that you back up your files. This way you can easily retrieve files if they’re accidentally deleted. And if something really goes wrong and you have to format, well, at least everything was backed up. Note: While damage shouldn’t occur because of the steps below, it’s always best to have your important documents backed up just in case. It’s an important precaution to take anytime you are doing anything major to your operating system. Typically, computers have lots of programs installed that are no longer being used. Maybe you installed a trial version of software and decided you didn’t like it. Maybe there’s an old game on your hard drive that you no longer play. Whatever it is, there are probably old programs that you no longer use that are using valuable hard drive space. Reclaim your hard drive by removing any old programs that you no longer use. Important Note: If you want to remove a program, but are concerned you may need it, double check to make sure you have the software on disc. If you do, you can always re-install it at any point, should you need it. DO NOT remove any program that might be important or necessary for your job, or any program that you may have a difficult time getting again once it’s removed. Look through the list. When you find a program you no longer use, click on it, and then click on the Uninstall button. Follow the prompts until the program is uninstalled. Reboot if necessary. Continue until you have removed any software that you no longer use. Now that all your old programs are removed, it’s time to clean up the places where you store files, shortcuts, documents, and anywhere else that gets messy. Take some time to look at your desktop. Are there any items on there that can be removed all together? If so, delete them. Look at any shortcuts on your desktop. You can tell which items are shortcuts because they have a box with a little arrow in the bottom left corner. Are there any shortcuts that you never click on? If yes, delete them. Note: deleting the shortcut WILL NOT delete the actual program. Are there any shortcuts left over from programs you just removed? If yes, delete them. Now, look at what’s left on your desktop. Does everything need to be there? Are there any files, shortcuts, or other that could be organized into a folder on the desktop? If so, create a new folder and organize your items. Continue cleaning until you have a nice, clean, easy to view desktop. If you use your My Documents Folder for storage instead of a network drive then you’ll want to take some time to clean up this folder. Review what’s in your My Documents folder. Is there anything that is out of place that could be put into an existing subfolder? Or, do you need to create subfolders for extra categorization? While you should create and use subfolders for organization, make sure you’re not making a bigger mess by creating a system that is unusable for you. Additionally, look to see if there is anything that you can delete. Often we save items to look at later, and by the time we get around to looking at them they are out dated, or no longer relevant. Look for material like this in your My Documents Folder. Delete any documents that you no longer need. If you download a lot of items off the internet, like pictures, ebooks, software, or whatever, then you’re bound to have a ton of extra junk in your Downloads folder. Over time, all this extra stuff adds up, and makes it slow to load your Downloads folder when you need to access it. Go into your Downloads folder and have a look around. Is there anything that needs to be moved somewhere else, such as into your My Documents folder? If yes, move and organize any item you need or want to keep elsewhere. Then, review what’s left. Do you need all these items in your downloads folder? Delete any item you don’t need, or that you know where to get again should you need it. Once you’ve done all of this, particularly if you have lots of files, you’re probably ready for a break, and by all means you’ve earned one. So stay tuned for part Two B where we finish up the discussion about ways you can clean up your digital files to get your computer running faster than ever before. Julie Strier is a freelance writer who likes to help you keep your computer clean and running fast. Email:julie@mybusinesswriter.com. Website: www.mybusinesswriter.com. As a word processing program, Microsoft Word can do many things. However, one of the things it hasn’t managed to do so well over the years is images. Sure, you can add images to Word documents, adjust them, move them around, bring elements backward or forward, and even combine images, but traditionally the process has always been a little clunky. Have you ever tried to select one shape, only to discover you actually selected the one you didn’t want? Have you ever wished that you could just “turn off” an image temporarily, so you could work with what’s behind it? Now you can do all of this and more – if you have Word 2010 or higher. Microsoft got wise to the frustration of Word users, and included a new feature in Word to help fix these problems and limitations. This feature is known as the Selection Pane, and while it’s one of Word’s most useful tools, it is also one of its best kept secrets. To access the Selection Pane, you need to have a shape or image on your document already. Please note that this feature works best when you have several images on your document. You can add images easily by going to Insert at the top of the Ribbon, and then selecting Pictures, Outlines, or Shapes. 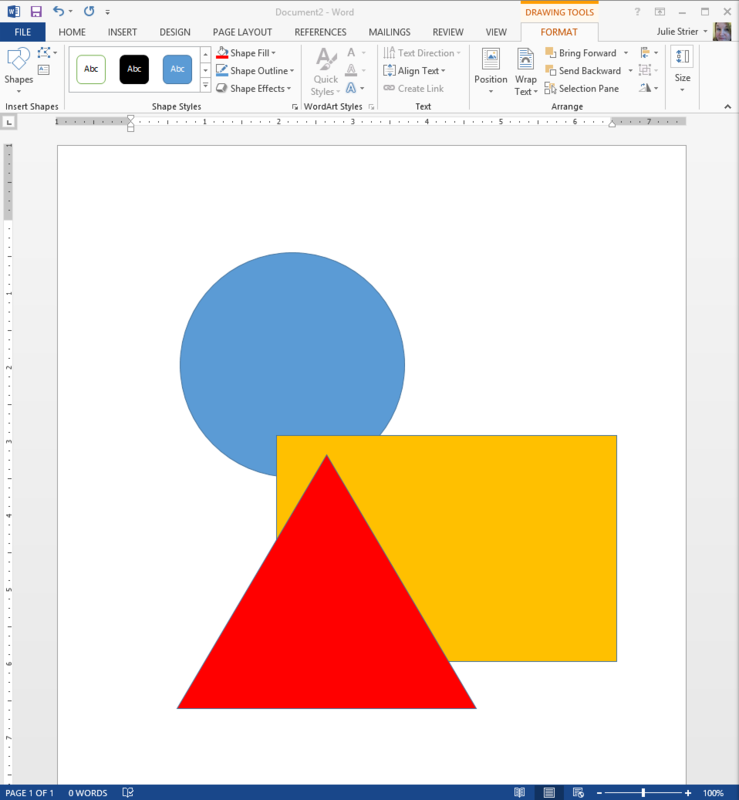 For the purpose of following along, open a new word document, and insert several shapes, say a circle, square, and triangle, and make them each a different color. You should now have something that looks similar to the image below. Once you have at least one image on the screen, you will be able to turn on the Selection Pane. To do this, click on any of the images on your document. A new tab should appear at the top of your Ribbon, called Format. Click on the Format Tab, and then click on Selection Pane. The Selection Pane will open on the right side of the screen. From here you can drag and drop your images to re-arrange them, or turn various layers off so that you can adjust the layers underneath. You can even opt to show all images or hide all images, depending on what you are trying to accomplish during the editing of your document. And that’s all there is to it. Once you learn how to use the Selection Pane, you will find that it goes a long way to alleviating the frustrations of editing image layers within Word. Julie Strier is a freelance writer who likes to help you get the most out of your software. Email:julie@mybusinesswriter.com. Website: www.mybusinesswriter.com.